Falcon College is a private institution of higher learning (high school) for boys aged 12-18 in the southern Matabeleland region of Zimbabwe (Latitude 20’12 S Longitude 28’58 E Elevation 3947 ft). Founded in 1954 in Esigodini (formerly Essexvale, Southern Rhodesia), on the remains of the Bushtick Mine, Falcon College is considered one of the premier secondary schools in Africa. The College has graduated a large number of successful individuals around the world, including a British member of parliament, surgeons and doctors, leaders of industry and commerce, soldiers and educators. The College has 40 km² of Matabeleland bush, 10 km² approximately is game fenced and houses Quiet Waters game park. The park contains examples of most of Zimbabwe’s plains game species, including zebra, giraffe, kudu, impala, tssessebe, bushbuck and warthog. The Campus itself is surrounded by an 18 strand electric fence (a reminder of the bush war of pre-1980) and is a small oasis of green in amongst the dry semi desert Matabeleland conditions. A functional air-strip is near-by. Its motto is “Sic itur ad astra” and the school badge is a representation of a Lanner Falcon designed by Jill Turner, the wife of a former Headmaster. 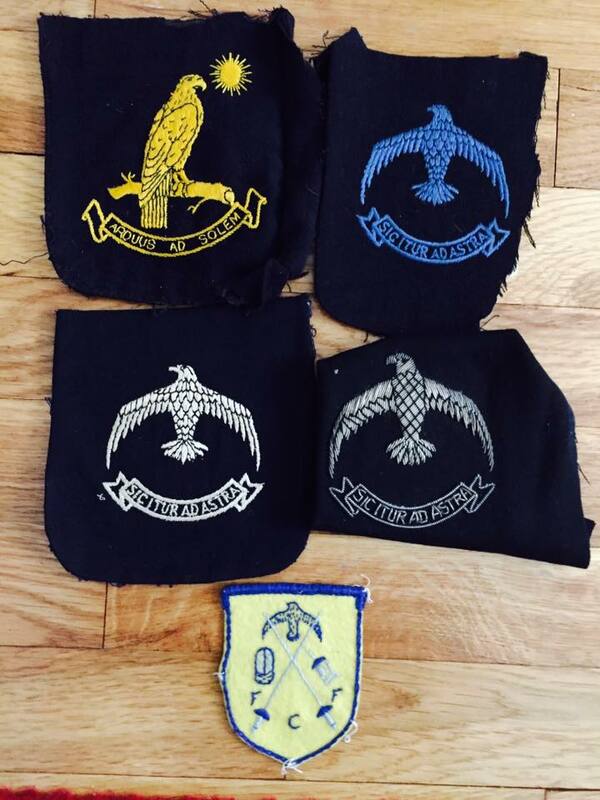 Various Falcon blazer badges over the years. The yellow badge was one of the first to be used and employs style and the motto from Eagle School. The blue badge was awarded for sports colours. The bottom design was in use in the 1960s for fencing. Most Falcon Old Boys will be familiar with the bright silver version on the left. Picture from Rich Moskwa. Originally Bushtick Mine, and with 36 boys and a handful of staff, the college was founded on Wednesday 3rd February 1954. It was officially opened by the Governor General of the Federation of Rhodesia and Nyasaland, Lord Llewellin, on Saturday 10 April 1954. Much has changed since then but the college has some remains of its founding days. The old mine and its buildings and facilities were adapted to the needs of the school, and (over the years) a great deal was added. The boys were first accommodated in small groups, in old mine houses which were given the names Kestrel, Augur, Shrike, Bateleur, Hawk, Harrier and Kite and their living conditions were pretty primitive. Most did, however, have indoor toilets, unlike the staff who also lived in old mine houses but with ‘snake infested outside P.K.’s.’ Classes were held in the old mine offices (now the present Arts Block) and to make it easier and quicker to move around, the boys were allowed to have bicycles. The first Headmaster was Mr Frank Cary who had been Head of Eagle School in the Vumba, and he was the inspiration behind the early days of the school. He was known as ‘Tank’ and he and his wife Anne became the centre of the Falcon ‘family’. The current headmaster is Reg Querl. The original motto was Arduus ad Solem. Hervey – after Hubert Hervey, adventurer, gentleman and soldier, who was killed in the 2nd Matabele war, and who was buried in the Matopos. The College is a fully integrated school with admittance based on strength of prior education and character of the applicant. Although the vast majority of students are Zimbabwean, others attend from neighbouring countries (Zambia, Botswana). Some scholarships are available to deserving students whose particular financial circumstances do not allow for the payment of school fees. There are six houses – Founders, Hervey, Oates, Tredgold, George Grey and Chubb, each comprising the full range of year groups. Each house has a housemaster in charge who lives nearby and makes his presence felt about the house. Each housemaster has a house Tutor and 2 assistant tutors, and other members of staff, who assist in duties. The Head of House is automatically a College Prefect and under him there are 5 or 6 house prefects, each of whom is in charge of a year group. Senior boys in the house are also required to take over various responsibilities. The form one to form four year groups live in dormitories, overseen by a prefect whose study/bedroom is attached to the dormitory. Boys in the Upper and Lower Sixth live in their own individual study/bedrooms. The house system is a competitive one because houses compete with each other in a range of activities such as singing, drama, and the full range of sports. The Lower Sixth boys are generally involved in the organisation of these inter-house competitions, thus assisting the Upper Sixth This also gives them training in organisation, assuming responsibility and being leaders. All these skills are needed when they become members of the Upper Sixth. Forms one to four are responsible for cleaning their dormitories, making their beds, taking their clothes to the laundry and generally help to keep the house and its surrounds clean and tidy. The Lower Sixth clean their own studies while the Upper Sixth have fags drawn from Form 2 to assist them. Boys can either go home, or, with parental permission, may go to friends or relatives on two Fixture Frees which last from break time on a Friday to supper time on the following Monday. There is a Mid term Exeat which is a day longer. In addition there are three floating exeats but these must be spent with parents. The College provides secondary education from Form I through Upper Sixth. Typically boys look to take their “O” levels at the end of Form IV and their “A” levels in their second Form VI year (Upper Sixth). Results are consistently in the top quartile of all schools in Zimbabwe. The teaching staff is grouped by academic speciality (science, language, arts etc.). Staff/student ratio is approximately 40/400. The College imbues sporting activity for all students as part of their educational process. The major sports include cricket (providing many Zimbabwe test level players), rugby, field hockey, football (soccer), basketball, tennis and field athletics. Other sports include water polo, squash and golf (the old Bushtick Mine having the first golf course in then Southern Rhodesia with grass greens!). These include a variety of clubs and societies ranging from falconeering to debating forums to theatre and the arts. The project began in 1986, and it was officially opened in 1988. It consists of a Nature Reserve and Wilderness Area which cover 8.1 km² in all. Quiet Waters aims to conserve indigenous fauna and flora and to further the educational pursuits of the College and to serve as a base for conservation education in other schools. It is also used for scientific research and provides recreational facilities for the College community and visitors. Several picnic sites are available for the use of day visitors within the Nature Reserve area while there are four chalets which can be rented for overnight stays in the Wilderness area. These facilities are all popular with staff, boys, parents and friends of the College. There is an interesting range of game but none is dangerous. Animals which can be seen are: kudu, zebra, giraffe, reedbuck, bushbuck, steenbok, tsessebe, impala, klipspringer, bushpig and warthog and the two species of jackal, while there are many smaller mammals which are not so easily seen, such as four species of mongoose. The rich variety of fauna and flora regularly attract enthusiasts from many societies interested in the natural history of the area. Good to hear all is going well at the college. Bush Holdsworth (61-65) and I (61-64) both from Founders are planning to visit the college during March this year! !We are in touch with “Sue”! !